As this blog post is very popular, I decided to create a booklet for free! A booklet with all the activities described in this blog post plus more! Click here for downloading the free booklet! 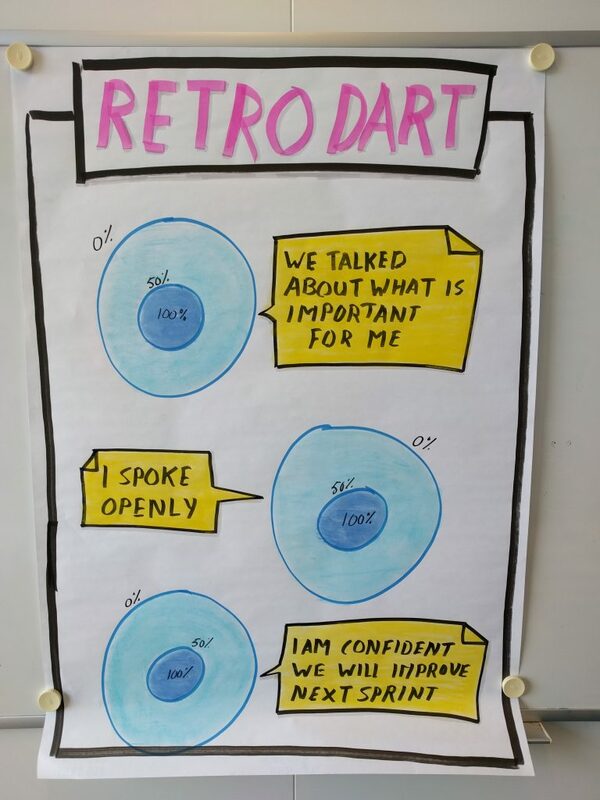 In this blog post, I want to share some ideas for hosting agile retrospectives, including some ideas on how to make a retrospective visual more attractive. 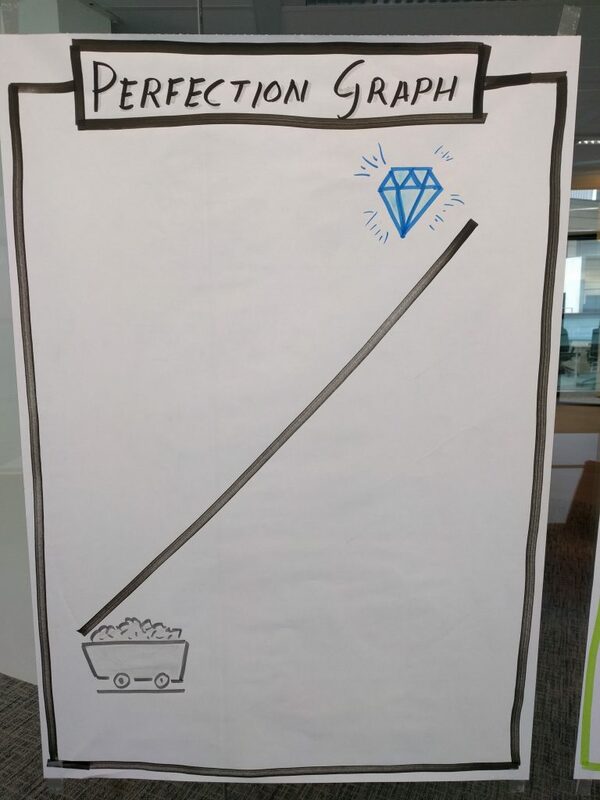 People who have worked with me, know how important I believe retrospectives are. Retrospectives are the backbone of every team, project, and organization. 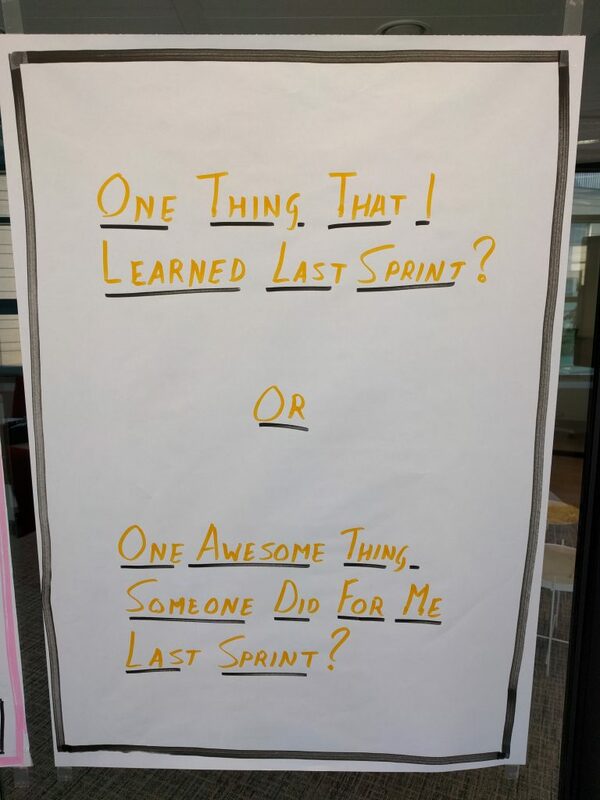 We can have a lot of discussion about Agile and what it stands for, but for me, when you have no regular retrospectives, things are definitely not Agile. I am not going to explain in depth how you should organize a retrospective. 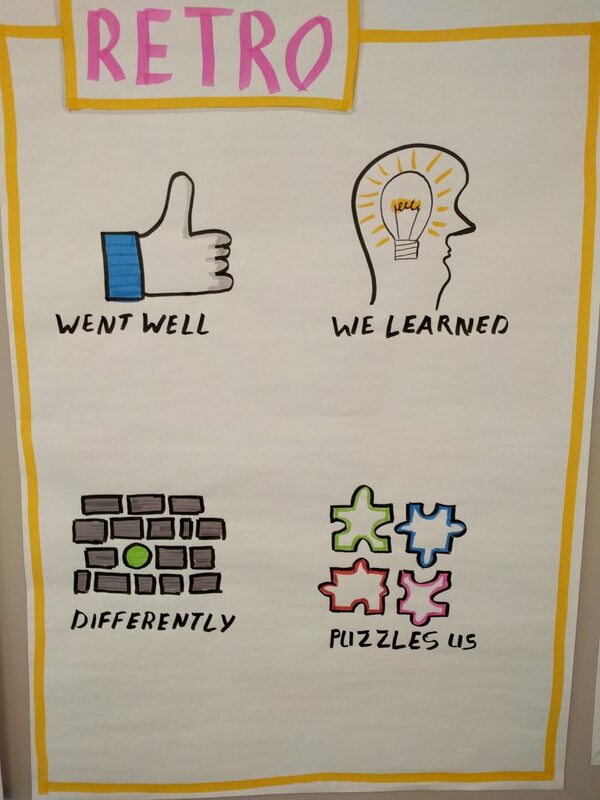 I really recommend, and I mean really recommend, that you read the book Agile Retrospectives: Making Good Teams Great by Diana Larsen and Esther Derby. It is a must read if you want to learn more about retrospectives. Now I hear you think… you know that activity! Good point! 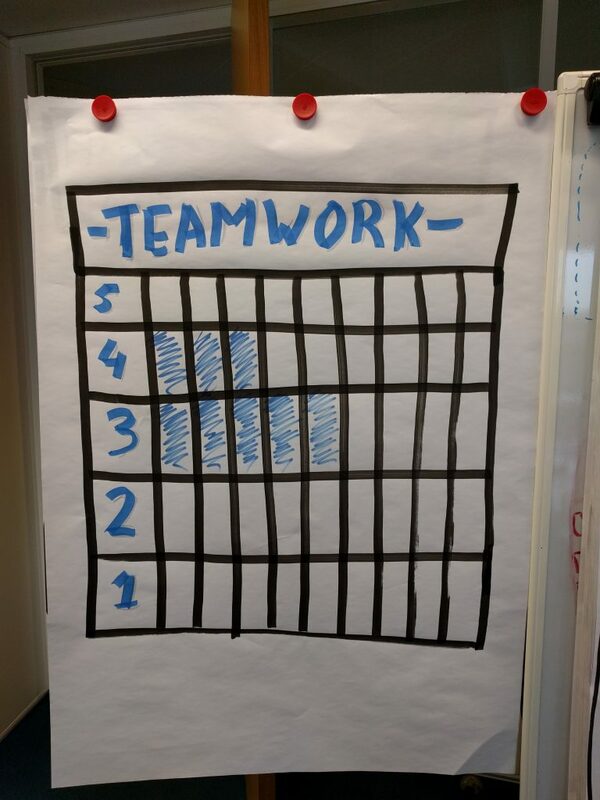 Many Scrum Masters, or facilitators, always use the same activities during the retrospective. Worst case, people already come in with their findings written on a sticky note to put it on the board as soon as they enter the room. When you talk to those teams, they often complain that the retrospectives are not interesting anymore, they are boring, not productive, and are considered as just another mandatory tiresome meeting. 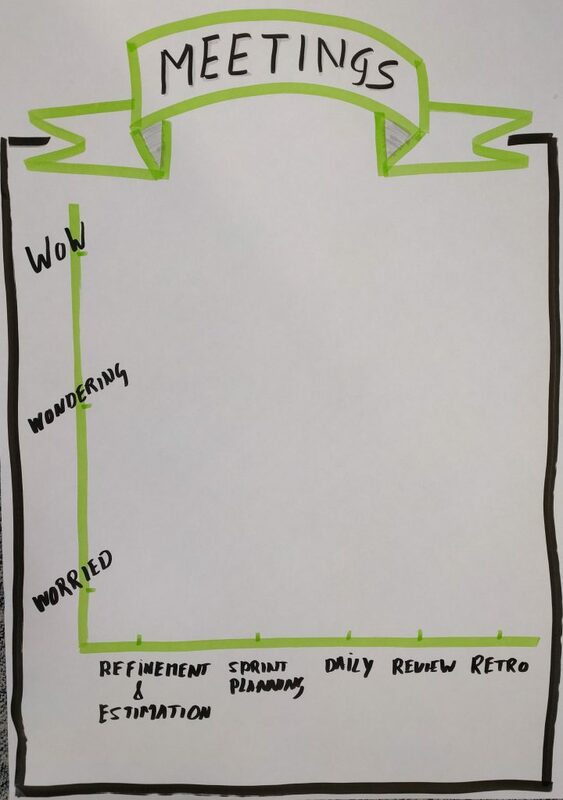 OMG… Retrospective Hell created by a facilitator who doesn’t know how to create Retrospective Heaven… A retrospective should be fun, energetic, surprising, and people should love it! I am not going to describe how to act as a facilitator here. I will just share the activities to make your retrospective fun and how to make things visual. To make it fun, it should be visual and colorful. 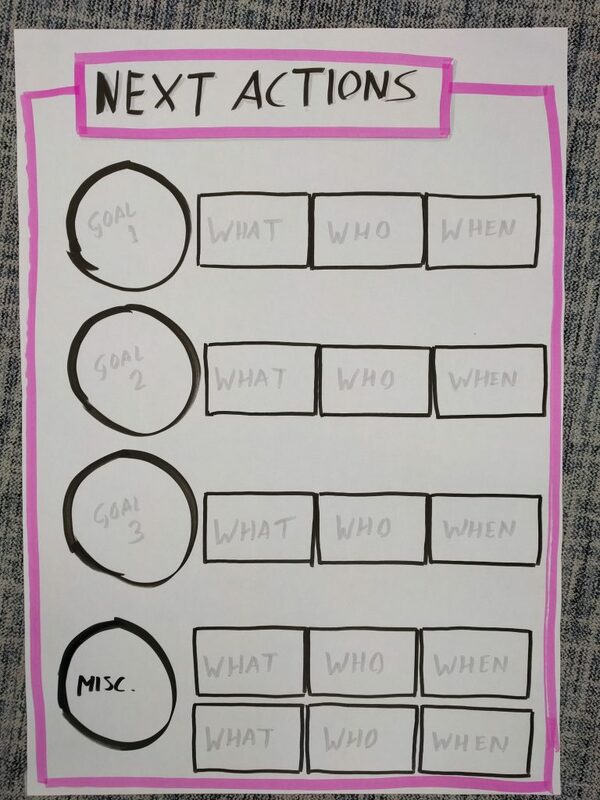 Note that most activities come from Retromat, some from the book mentioned earlier Fun Retrospectives, some I found using Google and some of them I created myself. I always said I can’t draw, I am bad at drawing pictures, really. 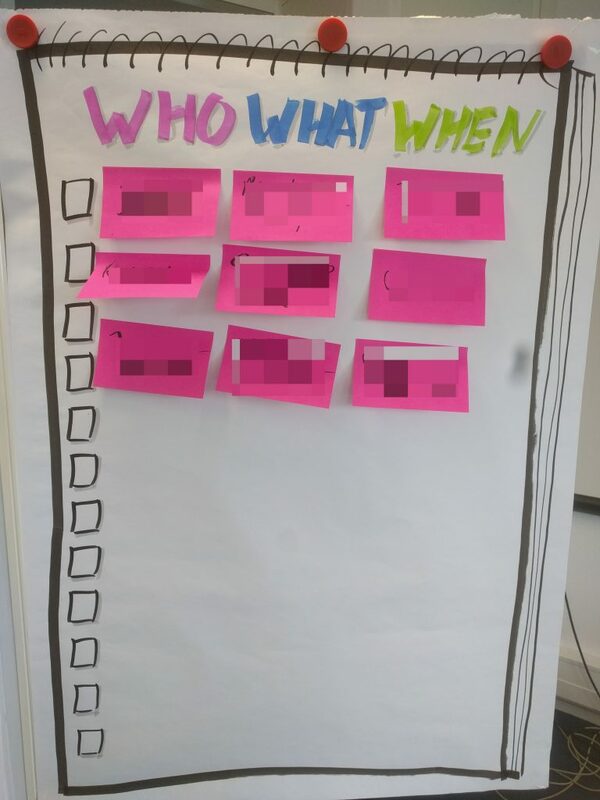 However, I just do it… and people seem to like it OK. As I said, retrospectives (any meeting) should be colorful. Are you interested in Management 3.0? The Modern Approach to Management in Agile Organizations? Download my free book about Management 3.0, or attend a two Day Foundation Workshop. In this step, we establish the focus for the retrospective, share the plan for the meeting, establish or re-purpose work agreements, and get every person in the room in the meeting. The activities described below are for getting people to speak out. As soon as you have said something, it will be easier to say something again. You connect people to the meeting. 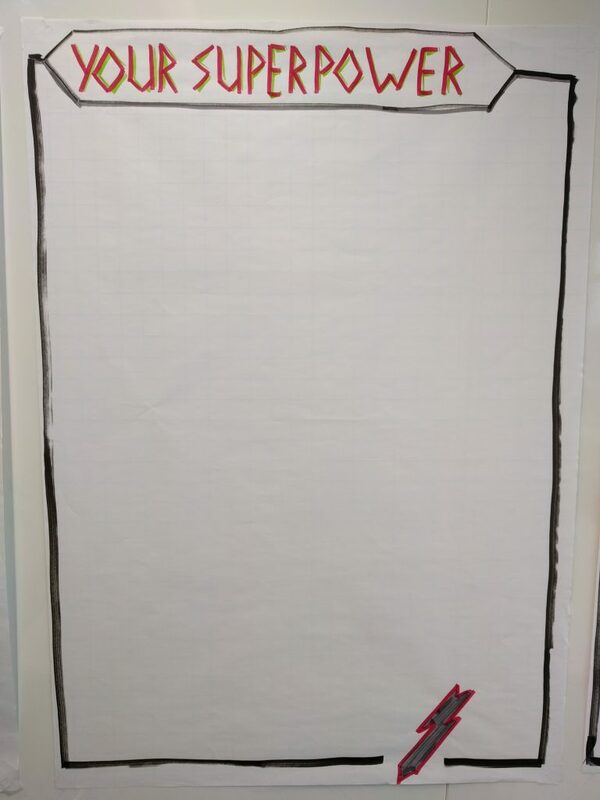 Before we start the first activity, I always show this flip chart. Always, and I always read it out loud. 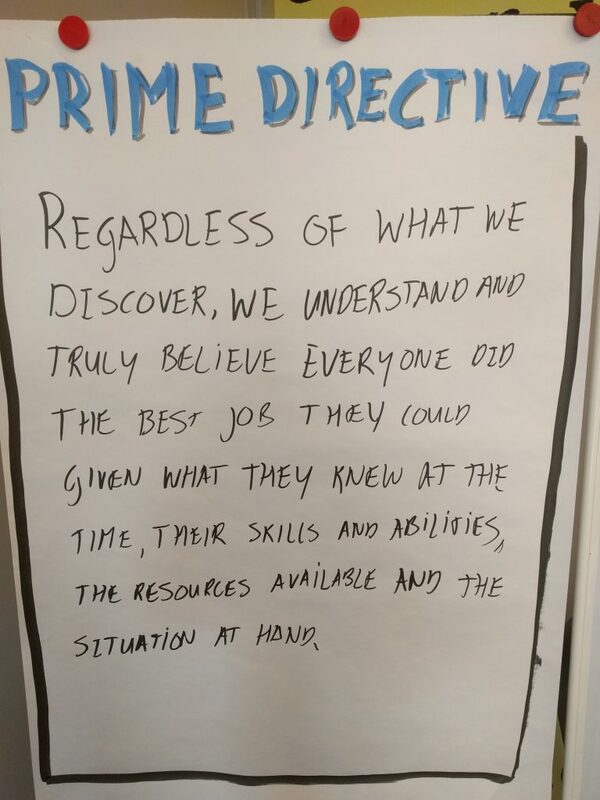 If I have the feeling something conflicts with Prime Directive of Retrospectives, there is a major issue. An issue I need to discuss with the manager or with the team, depending on the maturity level of the team. Ask people to describe the last iteration with just one word. Simple and effective, everyone has to speak out. You could ask people to explain their one word. Ask the team if they a pattern or something they want to discuss. 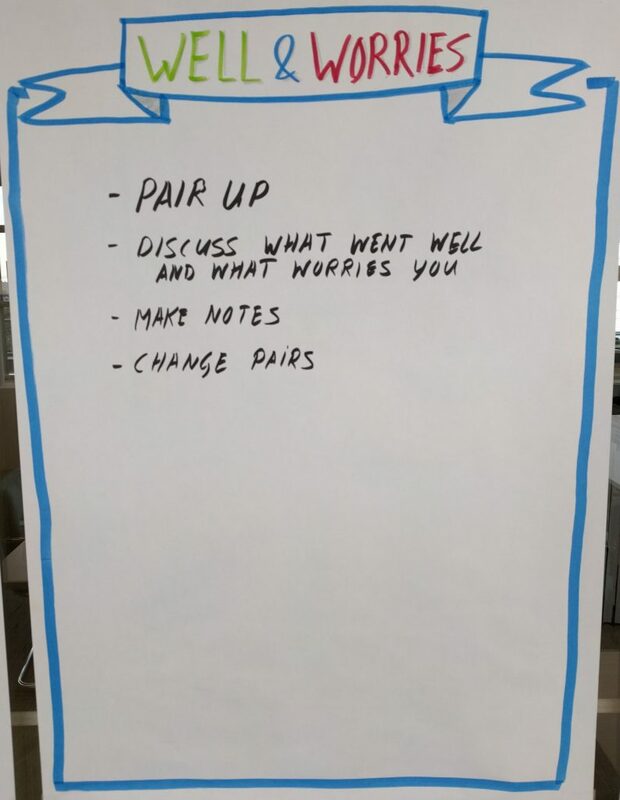 Activity from the book Agile Retrospectives: Making Good Teams Great. Explorer, exciting to be in the retro and eager to discover and learn new things. Shopper, happy to be in the retro and open to learn new things. Vacationer, glad to be away from his desk. Prisoner, totally doesn’t like the retro and it is punishment (s)he needs to be here. Ask people to write down their feeling on a sticky note. An E, S, V or P will do. Ask them to fold the papers. As the facilitator, mark the score on the flip chart. Make sure you put the sticky notes back in your pocket, keep it anonymous and throw them away afterwards. Discuss the results, in case you got all prisoners; I would advise you to improvise and talk about why they feel like a prisoner. 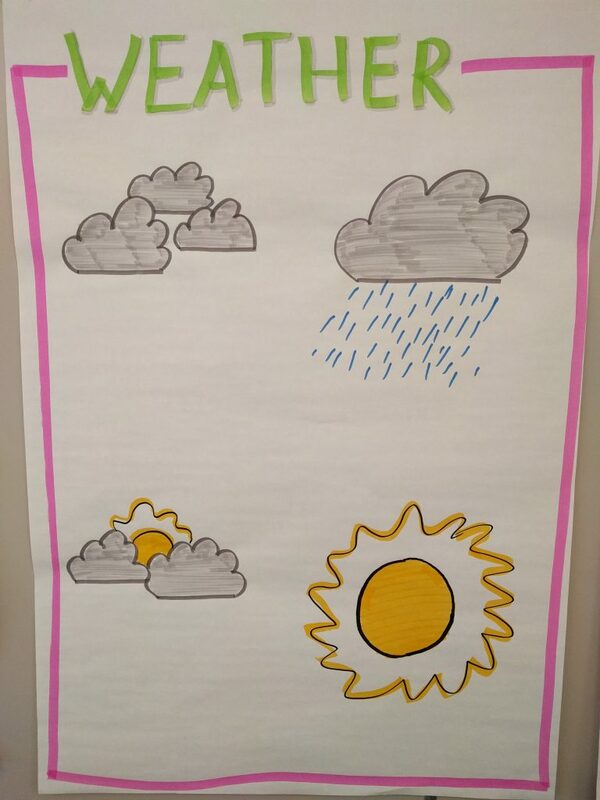 Ask people to put a sticky note on the weather that represents for them the last iteration. 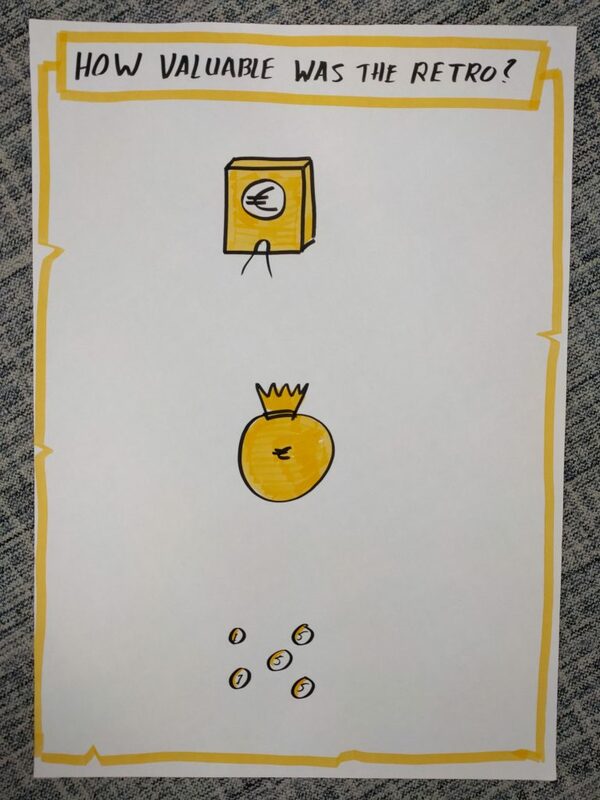 The drawing bottom right is not sunny side up… but the sun. Discuss the results and especially when there are some people feeling Sunny and some are feeling like Rain. 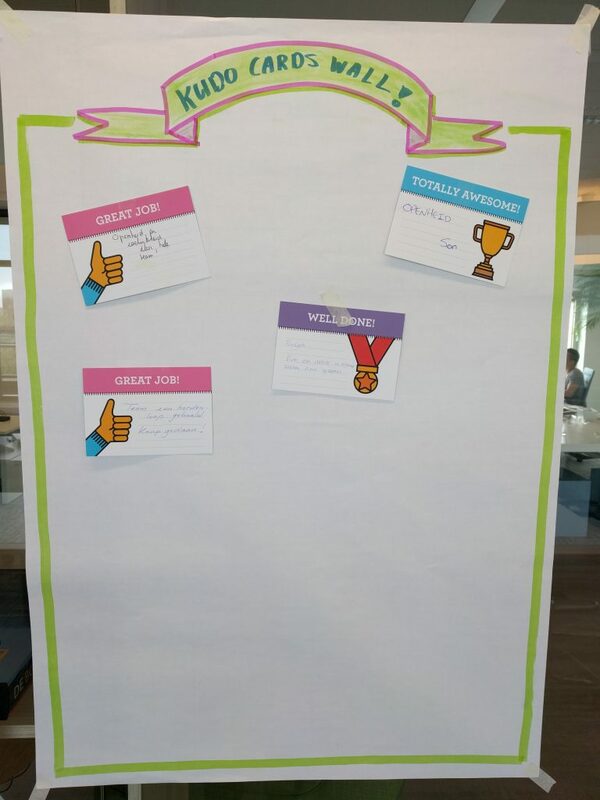 Ask people to put a sticky note on how they feel, or how they experienced the last iteration. Some people will ask what does this emoticon mean? Just say whatever you think it means. Ask them to explain why they put a sticky note on a certain emoticon. Therefore, it doesn’t matter what they think the emoticon is; they need to explain it anyways. Ask people to write down how they feel about team. Again make sure you do it anonymous. Mark the score, and discuss the results. You can use of course change the description or rank other things you want the team to rank. Ask people to select an Improv Card that represents how they feel about the last iteration. You can use any set of cards, as long as it triggers the ideas of people. This is an activity you can use in a retro with Superheroes as a theme. The first question is, what is your superpower? Which skill or competence do you bring with you to the team? Ask the people to write their superpower on a sticky note and in short explain it when necessary. Ask people how they felt about last sprint or maybe a specific topic. Winter refers to cozy, cold, inside, slow. Spring is related to new, grow, fresh, light. Summer stands for happy, hot, outside, cheerful and Autumn refers to change, colorful, windy and getting darker. Did they think it was perfect, a Diamant, or far from perfect, charcoal? In this stage, you create a shared pool of data. Try to get facts on the table, not opinions. If you discuss a specific topic, make sure the data is related to the topic. I often combine Gather The Data with the next step Generate Insights. 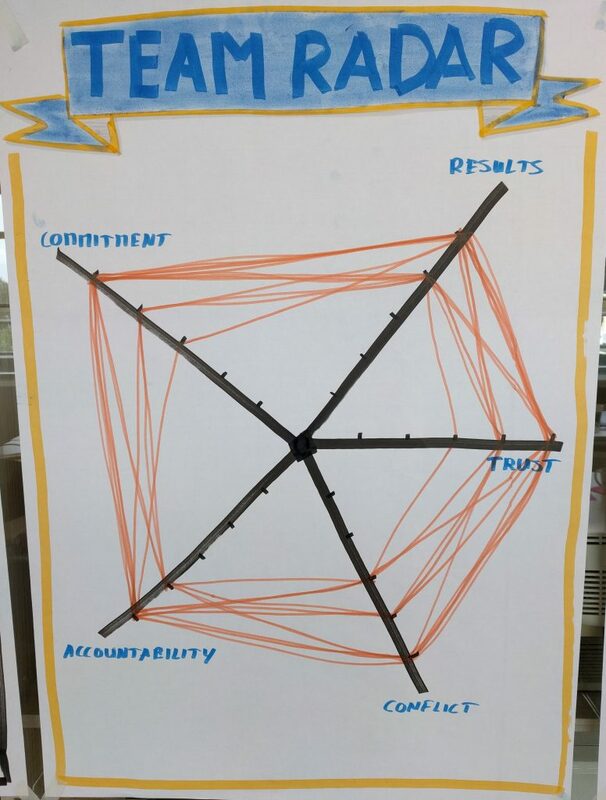 This is a practice from Management 3.0, the Celebration Grid. It is what you celebrate, do you celebrate failure or success? Neither, you should celebrate learning. The green areas are the areas you celebrate, and there is nothing wrong to celebrate now and then you use best practices. 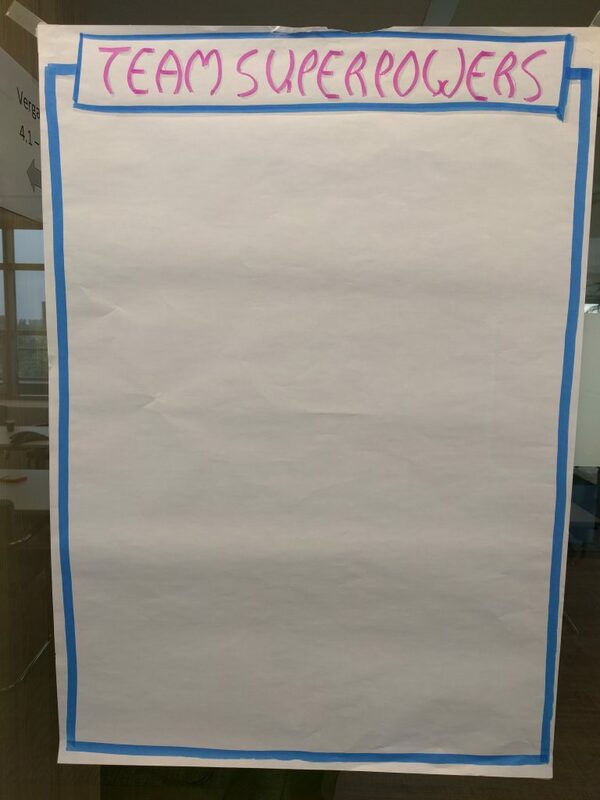 Ask the team members to write down the things happened in the last iteration and put them on the flipchart. Explain to them the category is not even that important, as long as the item is on the flip chart. 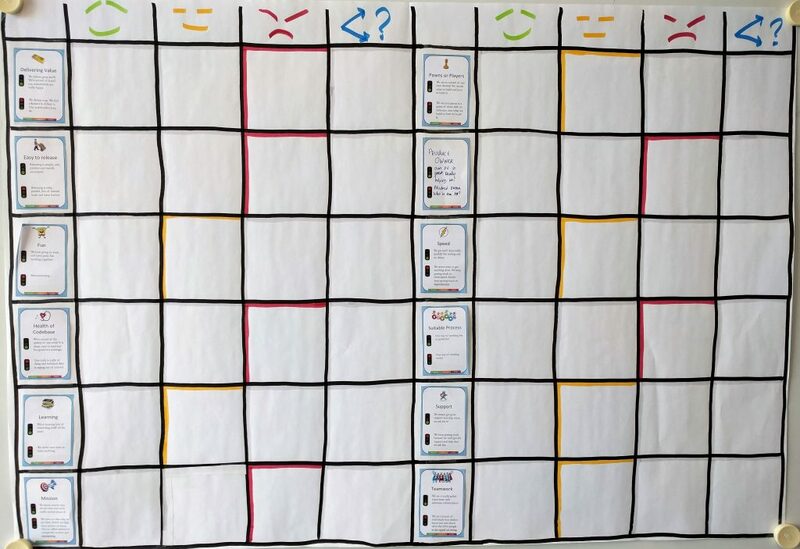 Be warned, this activity works great with some teams, but some teams also have no idea what to write down when they see the Celebration Grid or where to put their sticky note. Straightforward activity. What made people feel Glad, Sad or Mad the last iteration? Which events? Additionally, put a set of Kudo cards on the table and challenge the people to give each other a Kudo card. As always, lead by example and give the first Kudo card yourself. This could also be the start of your team Kudo Card wall. 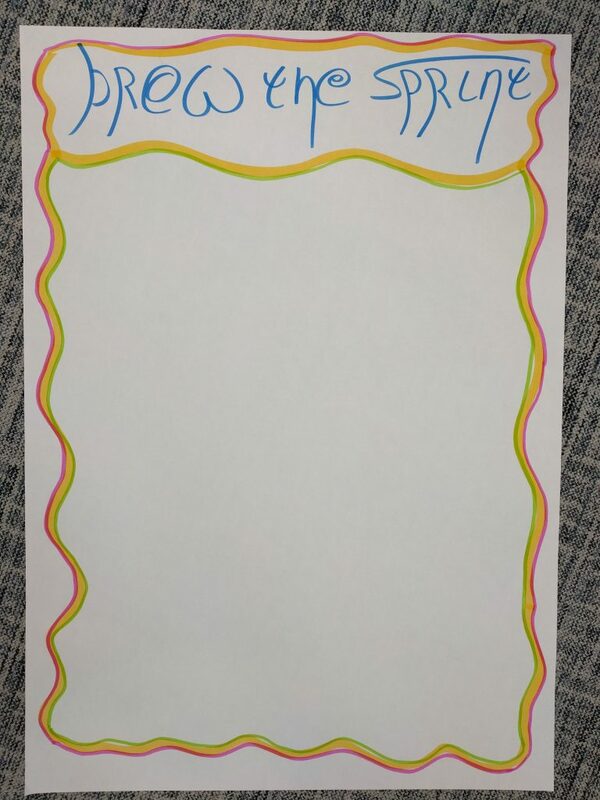 Ask people to write down things that happened and to put them on the flip chart where they think the item should be. The most interesting sticky notes are when people categorize the same events/facts in different areas. This is a more complex activity. The activity is described here, it is inspired by Spotify. I do this activity every three/four months. I call it the Improvement Score Board. Spotify calls it the Squad Health Check. A tool to get insights on several areas at once. In this case, we talked about topics described on the flip chart. However, feel free to pick your own topics. Make forms where you explain in more detail what the topics are. Ask people to give scores on the form. In this case 0..10. Collect the forms and mark the scores on the graph or ask people to do it themselves. Depends maybe on the topics you want to discuss. Discuss the results with the team. 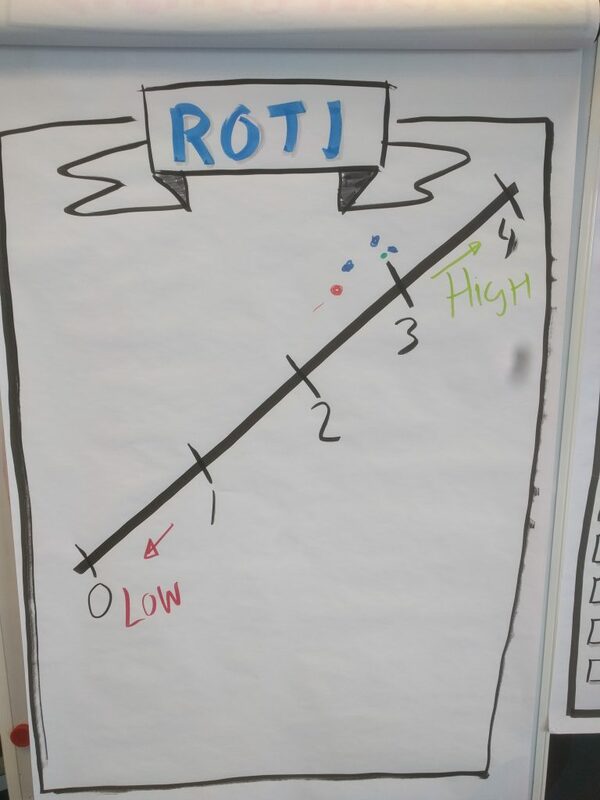 Organize a lean coffee to collect data during the retrospective. 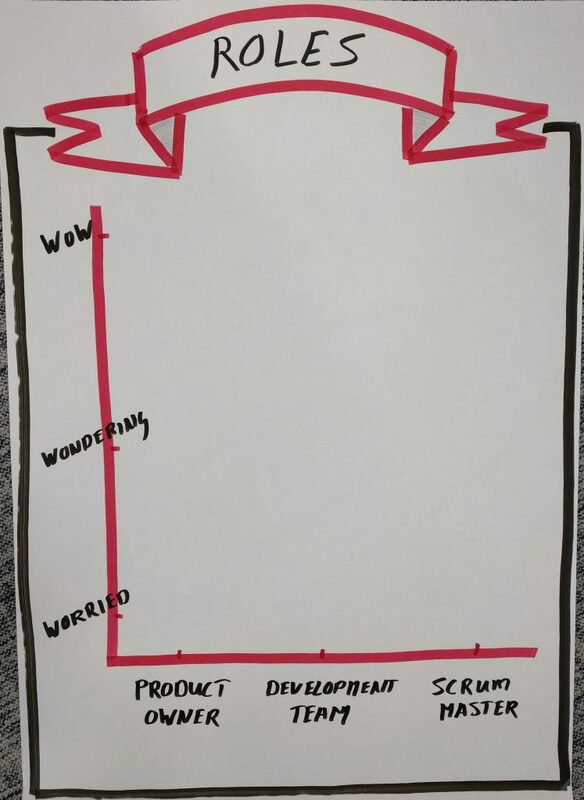 The lean coffee is explained on the flip chart or you can read more about it here. This is a free format discussion, so you just have to see which topics the team will bring up. Another straightforward to collect data. 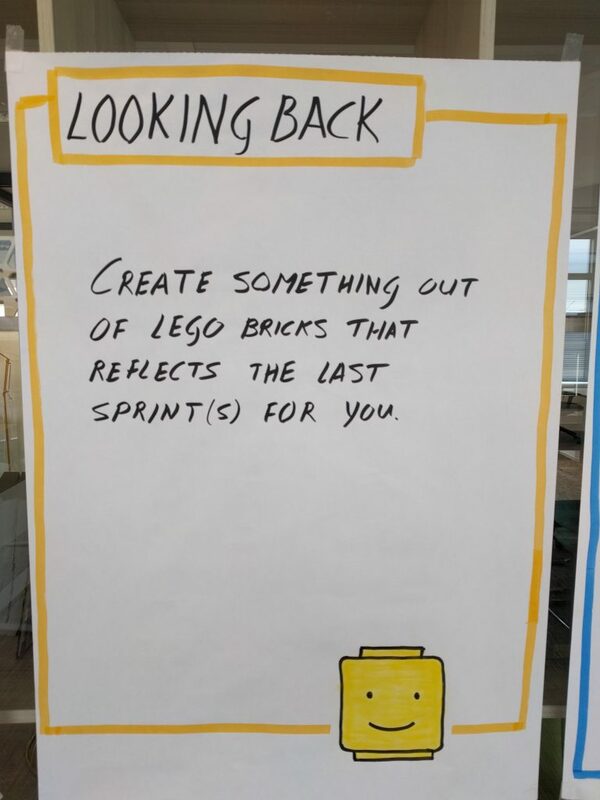 Ask people to write down the things that happened during the last iteration and put them in the specific category. The categories are Liked, Learned, Lacked and Longed For. Ask the team to group the cards them, don’t do it yourself. Make your life easy as a facilitator. 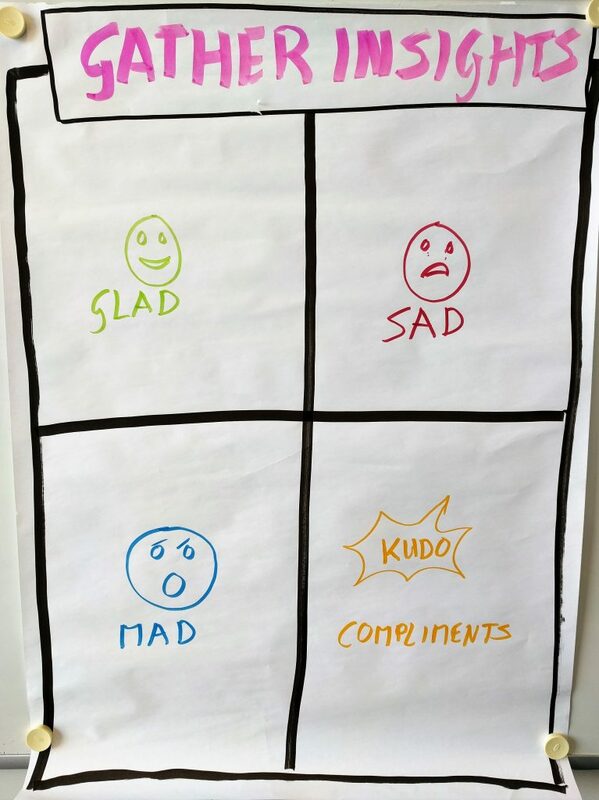 This activity is related to Scrum and can be used to evaluate how happy the team is about the different Scrum elements. 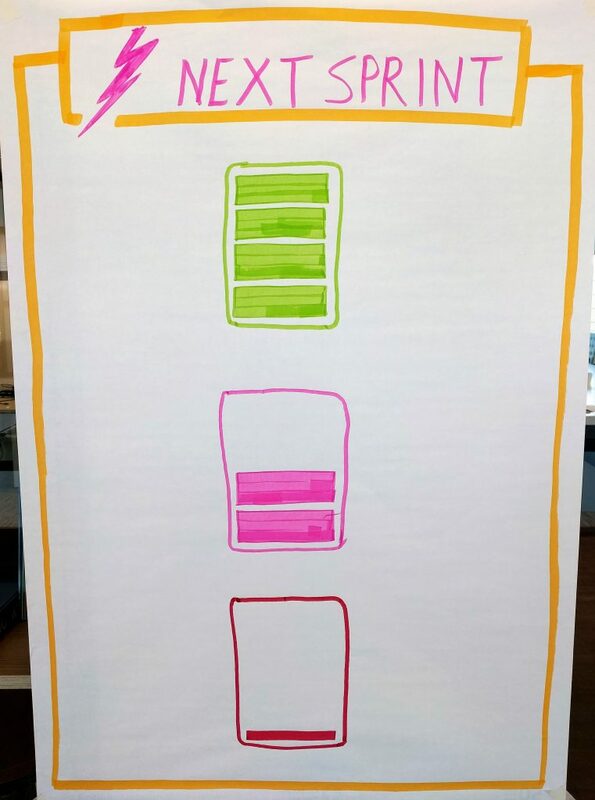 Three flip charts related to the roles, artifacts, and events of Scrum. Just ask them to put sticky notes on the flip chart how they feel about the different items. Next step is to discuss the outcome. Why do they think Wow it is great, or Wondering if it is OK, or are Worried about something? You can use the three W of course for every item you would like to review with the team. Yes, indeed a typo in the title of the flip chart. 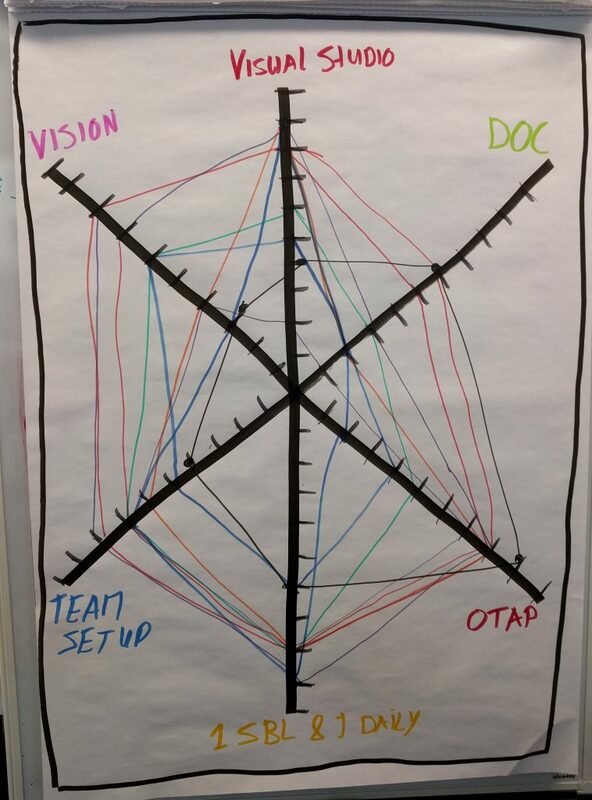 An example of how you can discuss and make visual how the team thinks about the five dysfunctions of a team. 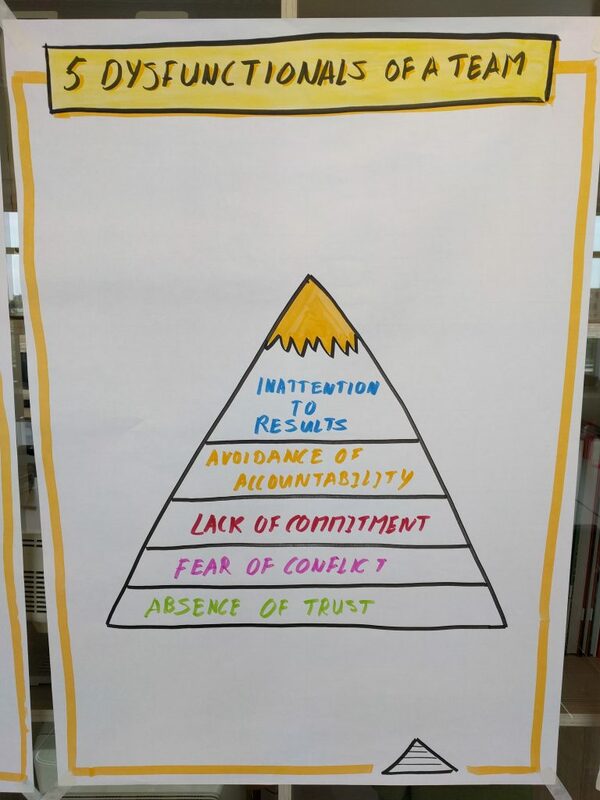 First, create the team Radar, and the next step is to discuss the score using also the pyramid. I used the questions from the book to collect the data. I would advise you to read the book first before playing this activity. I can’t make it more straight forward, just ask people to write down what happened in the iteration, ask them to group the things and discuss them. Another activity to collect data. What do you think was super? What do you think was strange? What do you think was bad? What didn’t you dare to do? Yes, I know Batman is written with an t.
This is basically the same activity as for example Liked, Learned, Longed For, but by using different terms, pictures you challenge the team and keep it fun. 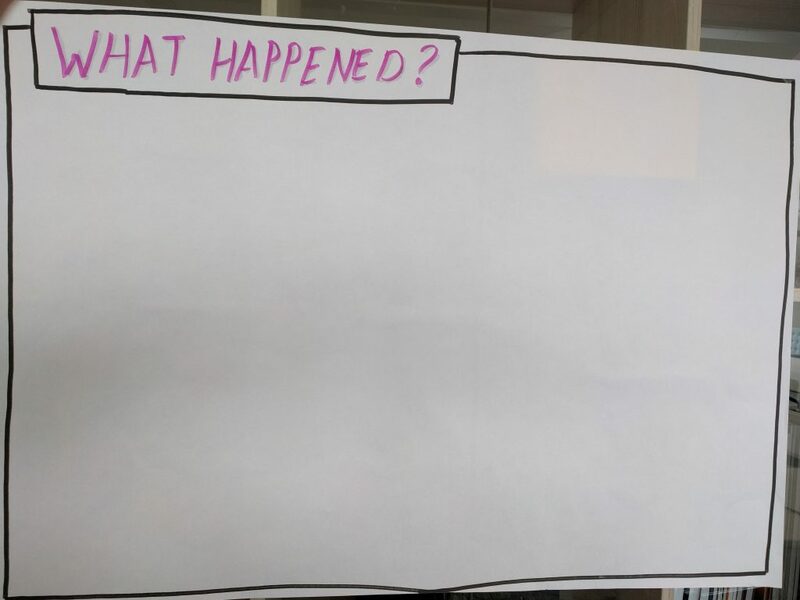 A simple activity where people pair up and write down what went well and what worried them. Make groups of two people and ask them to fill in this form: What Went Well – What Worries You – Form – A3. After the first step, one person of every group goes to the next group, one team members stays with the form. By rotating people, they will see items of the other groups and this will generate new insights. After the second step, discuss the results with the whole team. In this case, I reviewed the Definition Of Done. I first asked the people to pair with someone else. Rank the items of the DoD in order which one we always do. The second-ranking was which DoD items do we value most. Next step was splitting the team, every team again creating both rankings. The final step was to make a final ranking. The pair who was closest by the final ranking won a small price.I used this form to collect the data: We Do – We Value form. The last step was to discuss the ranking. Are there items that we can skip, or items that we value but don’t give enough focus? An activity like Liked, Learned, Lacked and Longer For of Superhero. By using different words and different drawing you challenge and surprise people again. In this stage, you try to discover root causes, patterns, create shared awareness. I often combine Gather the Data with Generate Insights. Therefore, I only have one example in this category. As it says on the flipchart :). 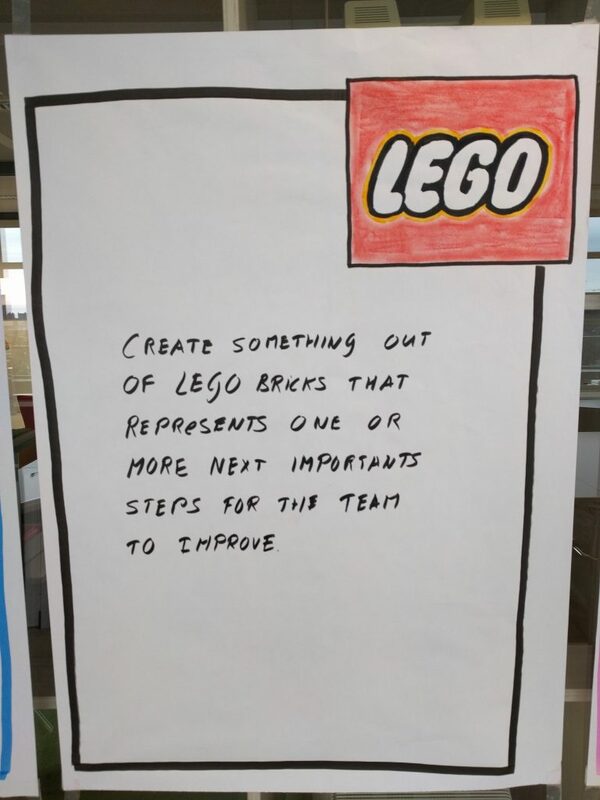 Ask people to build something with Lego bricks, which represents a possible next step for the team. This will make people think about issues and possible solutions. Discuss the creations, ask people to explain their solution. Finding root causes is already difficult but defining actionable items is even more difficult for some team members. Read my blog post about how to create actionable items. I don’t have that many different activities for this stage. It is the role of the facilitator to challenge the team to come up with actionable items. Just write the what, who and when on a sticky note and put it on the paper. If possible you can group them per theme or goal. Almost the same as the previous activity. However, this time without goals. Write down who will do the action, what the action is, and when the action needs to be done. Identify action is one thing, make sure they are visible for the team and the team is disciplined to execute the actions. 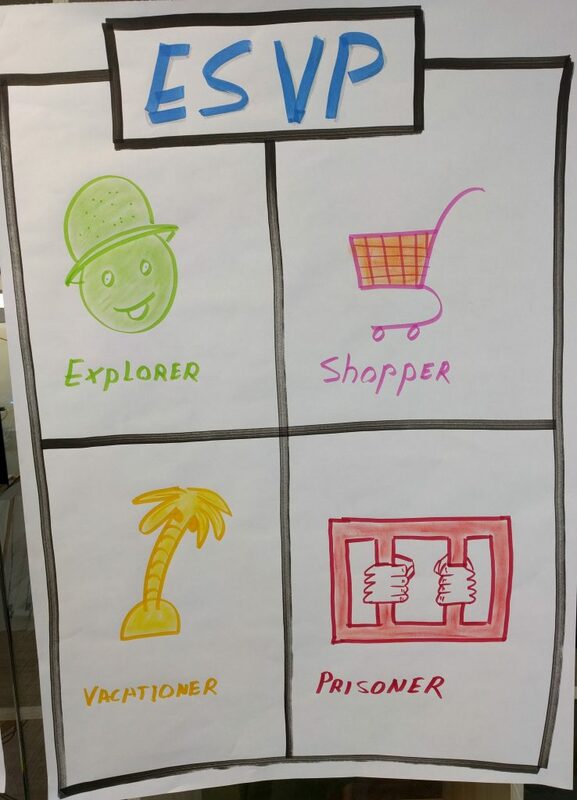 Another flip chart that describes how the team can define their actions. Just another format. 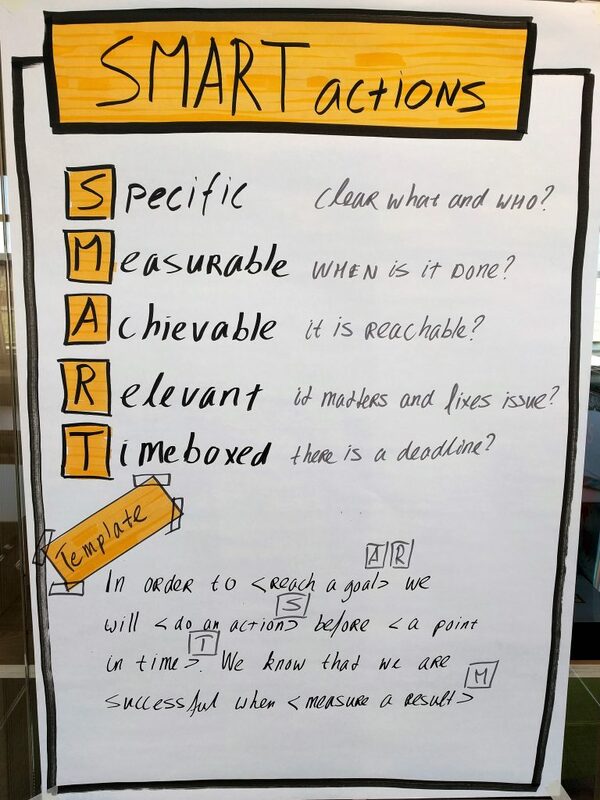 In this case, you can use the template at the bottom of the flip chart to help the team define SMART actions. The final stage of a retrospective, you review the retro, show appreciation to each other, and make also apply a short retro on the retro itself. 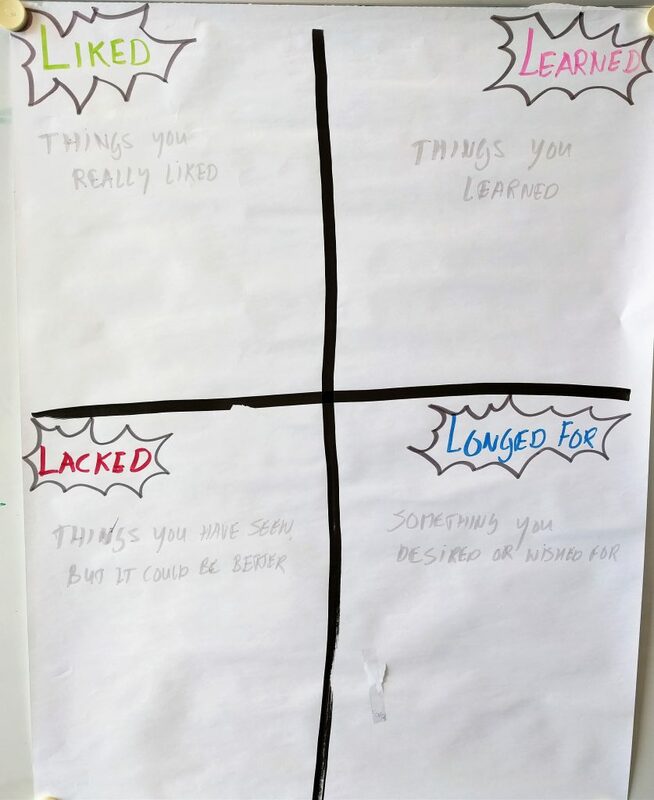 Some of the closing retrospectives can also be used as a starting activity. 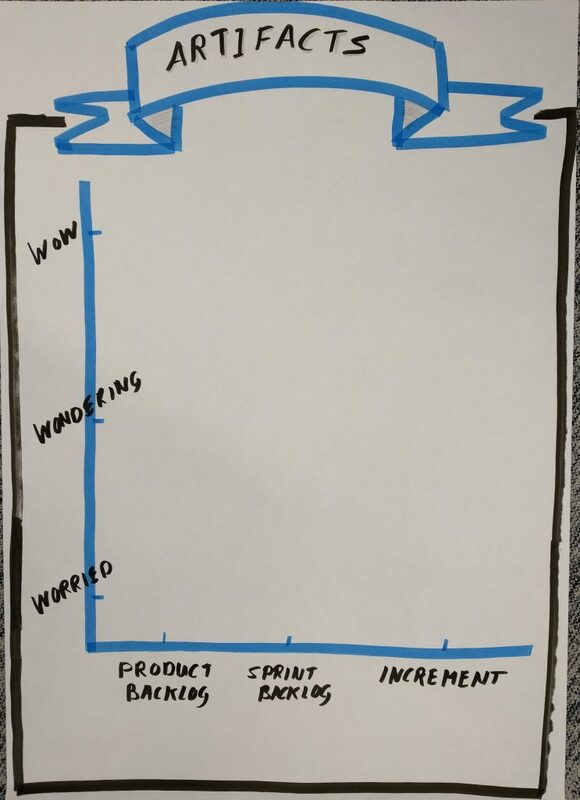 Ask the people to put a sticky note on the energy level that represents their eagerness for the next iteration. If the energy levels are low… there is work to do. 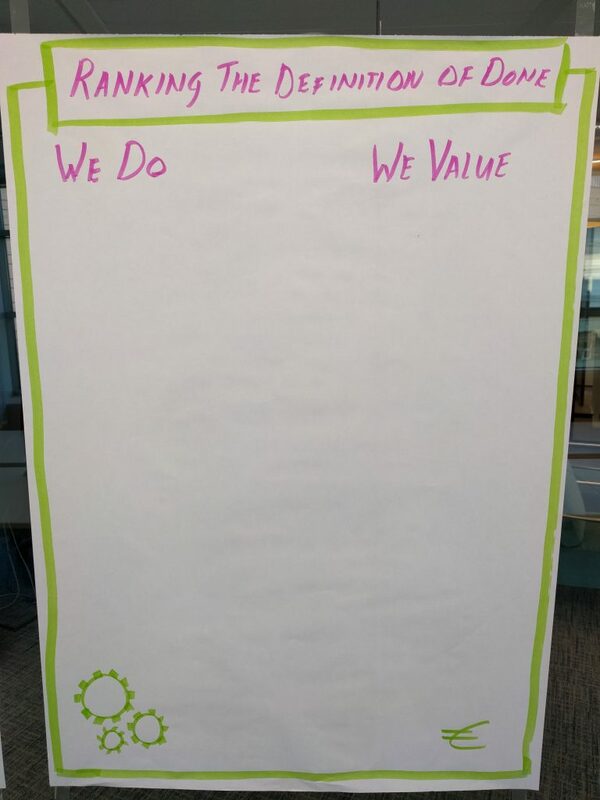 Ask the attendees to put a sticky note on the drawing that represents the value of the retrospective for them. If they all say it was low… there is again work to do. Ask people to write a Kudo card. This could be the start of a Kudo card Wall in your team. Lead by Example, make sure you also give one or more Kudo cards. 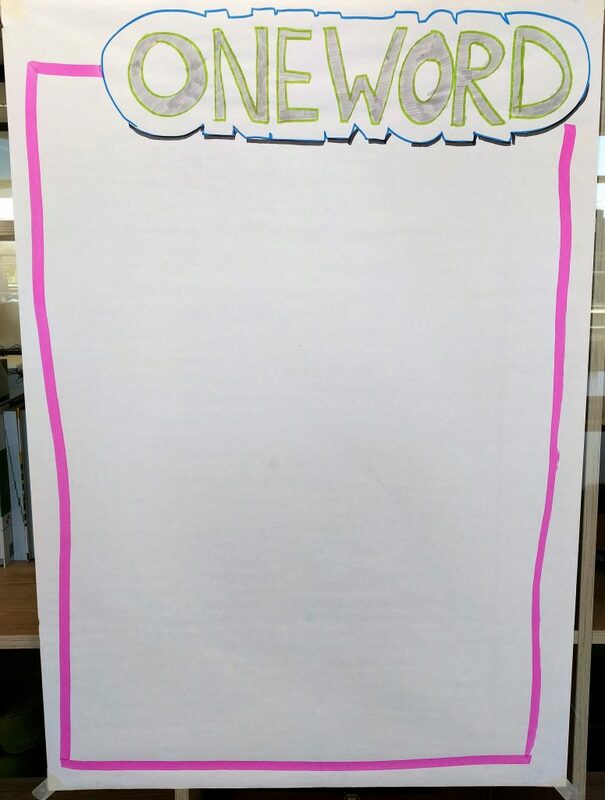 Ask attendees to write just one final word on a sticky note. Ask them to explain the word. Ask them to write a word related to retro, you could also look forward and them to write a word related to the future. Be careful, the retro is done but this could start a new discussion. 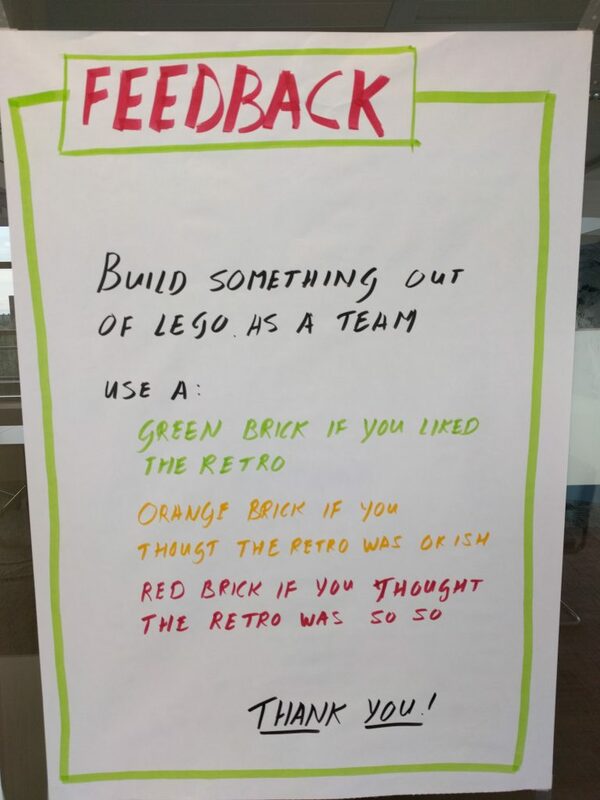 Ask the team to be creative with Lego bricks and build something that provides feedback to you. The colors will show how much they valued the retro. Ask the attendees to play “darts” with a sticky note. A quick way of getting feedback. Depending on the score… there is again work to do. An activity from the book of Esther and Diana. What is the Return Of Time Invested in the retro. Explain it should be about how they feel at this moment. The actions are not executed, but how do they feel at this moment about the time invested? 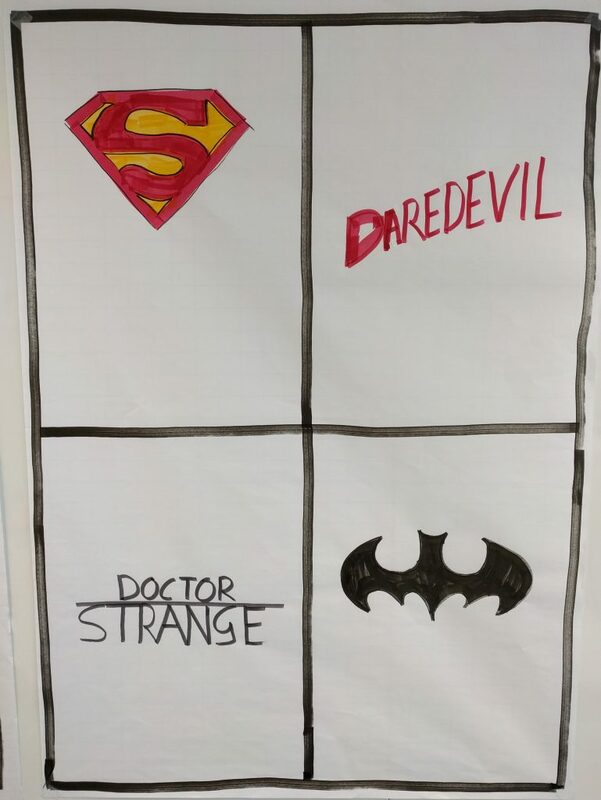 Ask the team to write down what they think is the superpower of the team. A positive closing of the retrospective. You can ask the team to write what surprised them during the retro and/or what made them feel good. 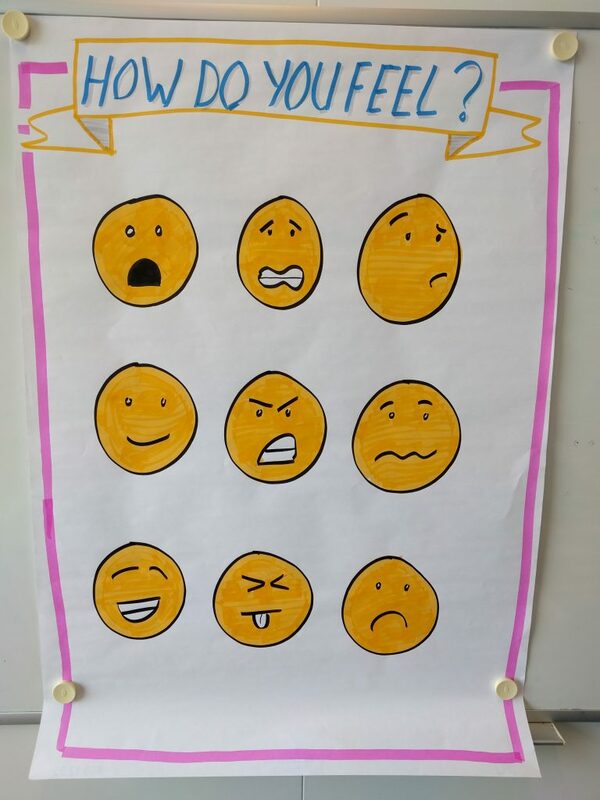 You can also just ask the team to put a sticky note on one of the emoticons when they leave the room. A quick way of getting feedback about a topic. You can use this also at the end of a meeting. 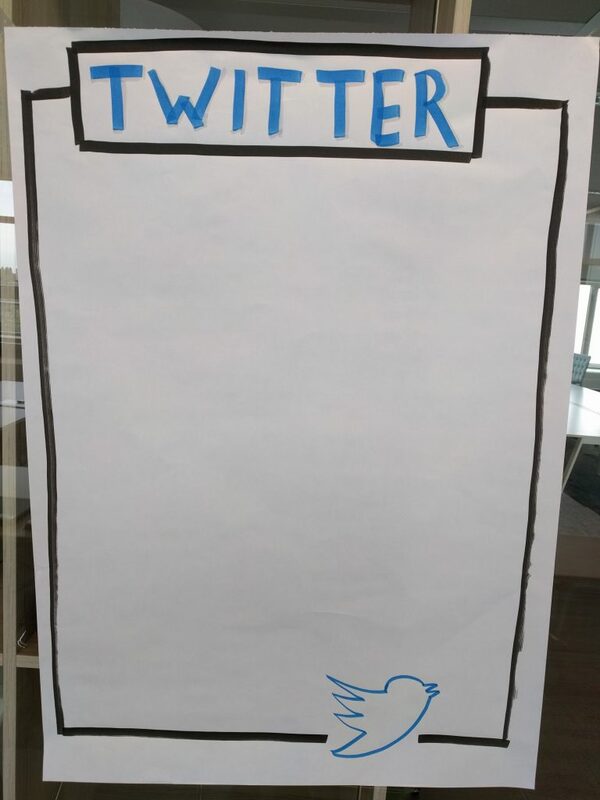 Create your own twitter wall. Ask the attendees to write in a maximum of 140 characters what they would like to say about the retrospective. Ask people to answer one of the questions, one thing they learned or a thank you to someone. Positive closure of the retrospective. By having two questions you give people the opportunity to choose, but you could also decide to just have one question of course. 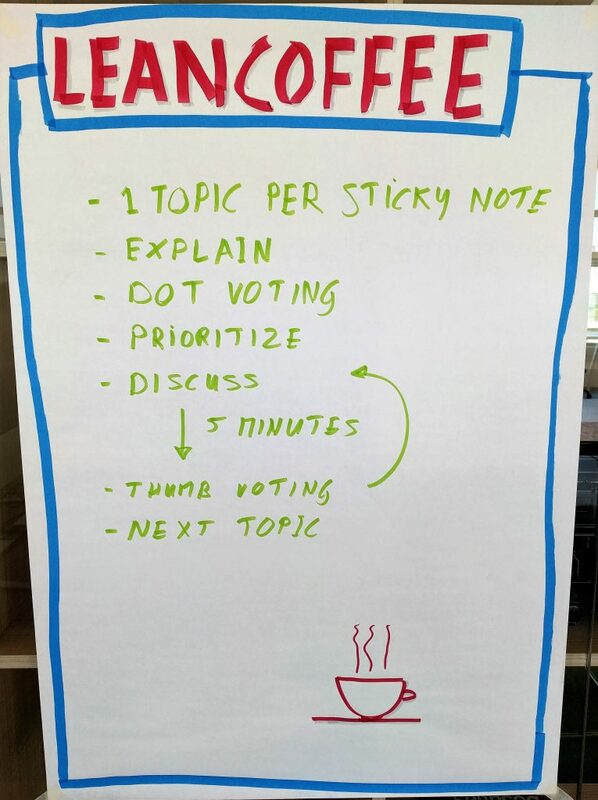 To close this blog post some general tips about using flip charts during the retrospective. 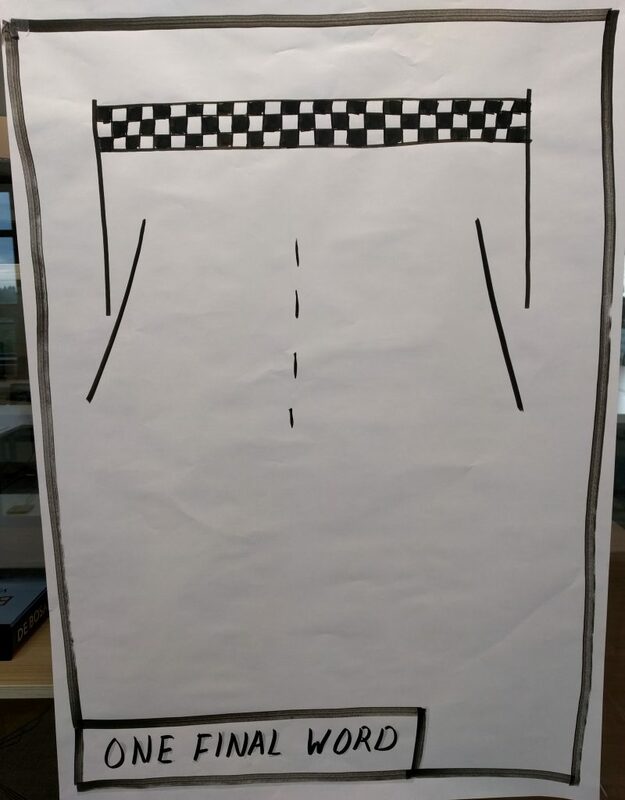 Don’t use regular whiteboard markers to create your flipcharts. Buy quality markers, from example Neuland. As my dad as carpenter always says, when having the right tools, the work is already half done. Always use sticky notes on the flip charts. 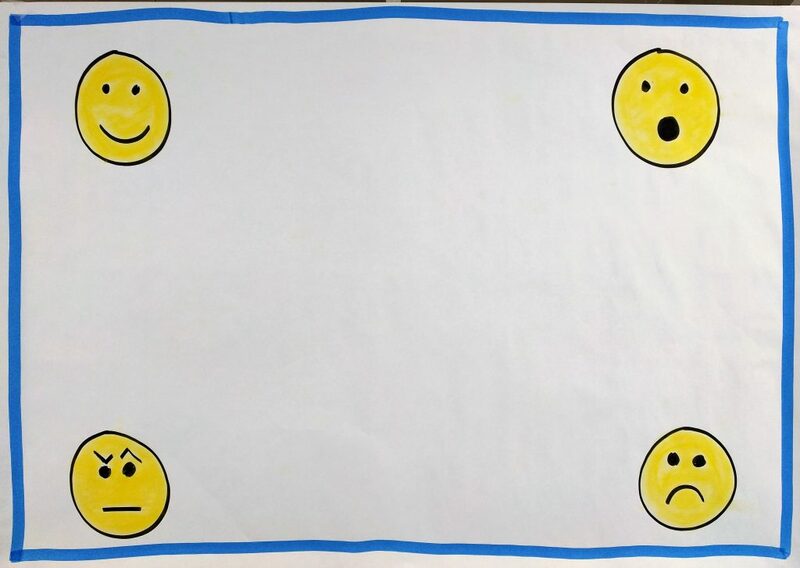 This will make it very easy to reuse the flipcharts. You will build up your own personal library of activities. There is nothing wrong using the same activity, but not every retrospective the same activity. Just start experimenting, just do it. 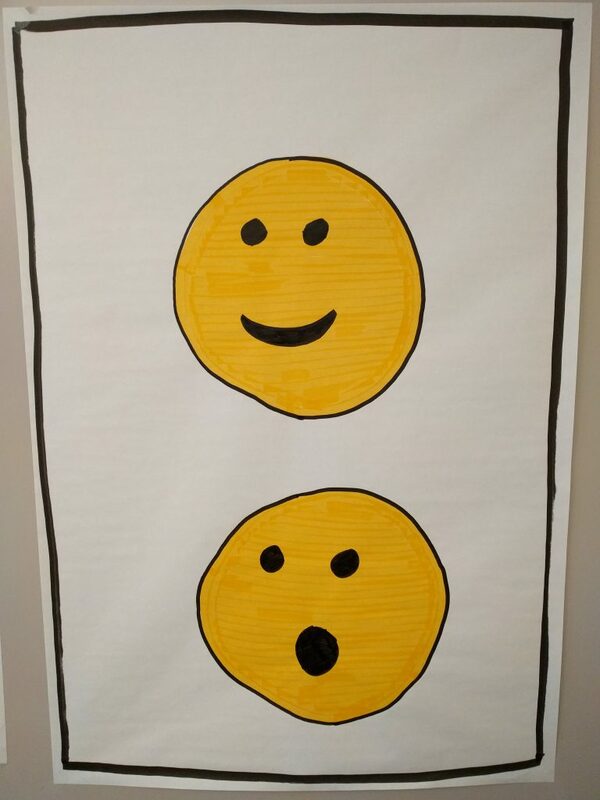 The first flip chart you will draw will maybe look bad, but you will improve every retrospective. As this blog post is very popular, I decided to create a booklet for free! A booklet with all the activities described in this blog post plus more! Click here for downloading the free booklet! 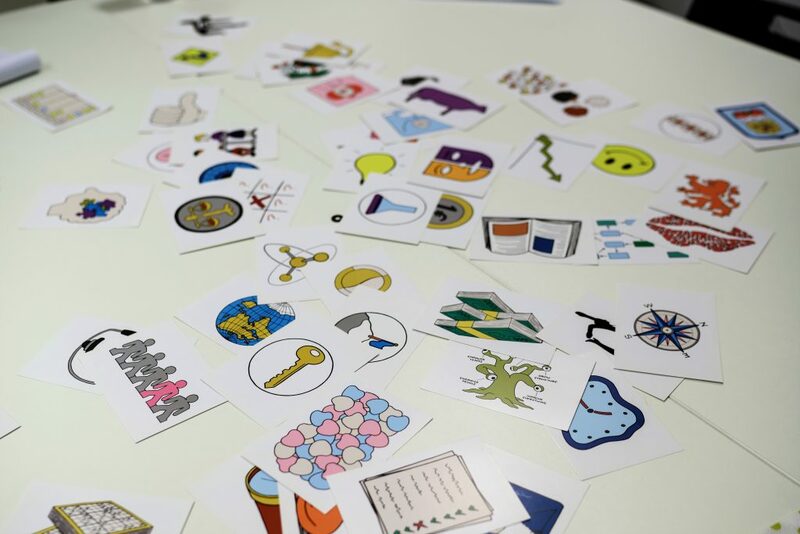 13 thoughts on "40 ideas to spice up your retrospective"
Great post, as usual! But some of the pictures are not loading, could you please check them? Now they’re all showing up. Magic! 🙂 Maybe it was a small glitch somewhere along the line. Gaaf Ralph, geeft veel inspiratie! Great post! This was the first time I’d heard of the Celebration Grid and I did it in our retro today. I am really glad you put pictures with each suggestion. 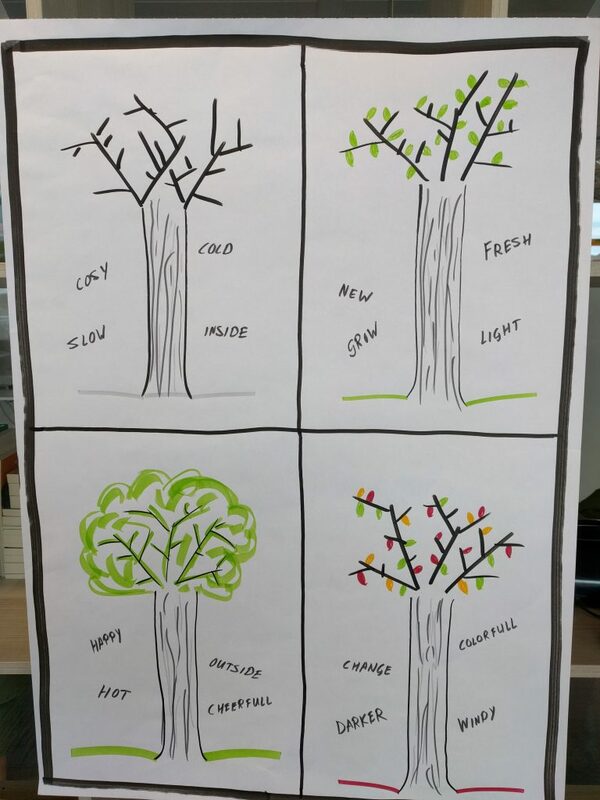 As a visual learner the pictures really helped me implement with my team. Some other websites explain but don’t show pictures for some of the activities, which is difficult for me to follow sometimes. I really like the visuals you provided! I will try and implement with my team, which is a bit difficult since 90% of the team are remote. Thanks. I understand your point however with tools like http://en.linoit.com/ you can also use this kind of visuals. 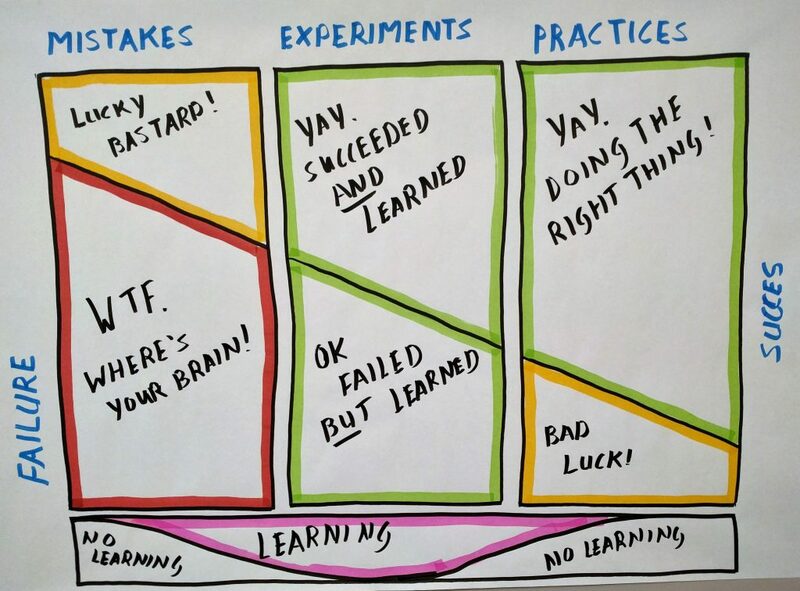 Be creative, experiment, and learn! Great to hear. That is the reason I shared them via this blog post! These are great ideas! Thank you for putting them here. I use most of the ideas here and the team loves it. Very kind of you to share these! True sign of someone who wants ALL teams to do well… and do better! What a bunch of great ideas! Excellent! Love these, I have used some of these but great to see them all in one place. Thank you, most kind sir.